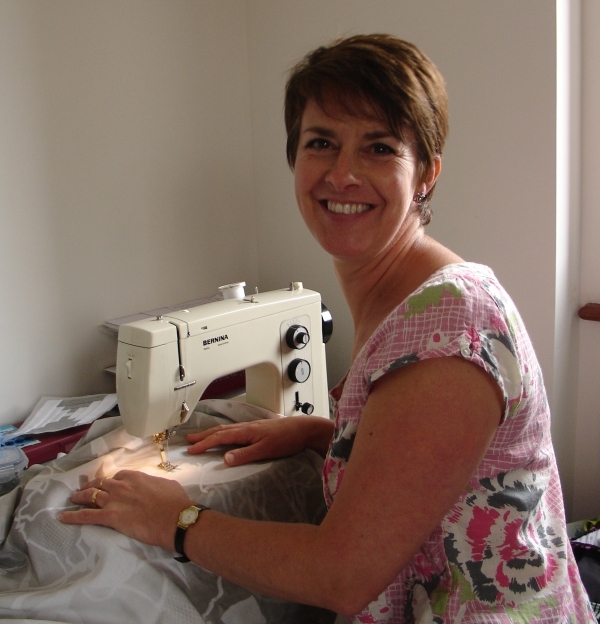 Jacquie trained as a Fashion Designer specialising in Knitwear at St. Martin’s. Through further study in pattern making and garment construction at the London College of Fashion she worked as a Pattern Maker in the Fashion Industry, creating designer collections for London Fashion Week. Throughout her career she has been involved in teaching and went on to qualify as a teacher in 2013. Inspired by constructing garments from a 2D image Jacquie rises to the challenge of creating a new silhouette as much as perfecting the fit of a sleeve. 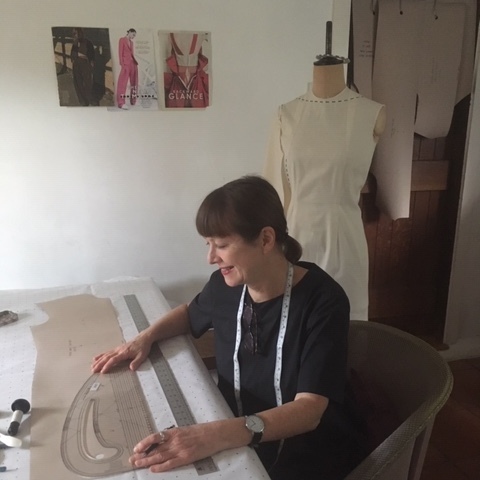 She is passionate about shape and texture and is curious to understand and master the technical side of garment construction whether pattern cutting or making. She finds working with new and interesting ideas, materials and people stimulating and enjoys overcoming the challenges that they may bring. Niki is an artist, designer and maker working primarily in the disciplines of textiles and printmaking. An established art quilter, her work is regularly juried into prestigious exhibitions and competitions here in the U.K. and Europe. Underpinning her textile art practice is an emphasis on discovery through drawing and mark making, experimenting with a variety of medium and technique to produce a strong visual aesthetic to inform her stitched work. As a tutor she is passionate in passing this love of creativity on to her students encouraging them to join her in their own creative process, celebrating their unique individuality. With over ten years’ teaching experience with a variety of classes, Gill has a passion for all things textile and mixed media. Gill’s educational background is in graphic design and after many years working in the design industry she returned to her first love, textiles. Her own work has a strong basis in natural forms and reflects a truly mixed media approach – incorporating fabric, paper, felt, plastics, stitch, heat tools and anything else with creative potential! Janet Edwards was originally a potter, but, in the nineties, back problems and six months in California with no kiln led her to a paintbrush. She has taught watercolour painting for many years, with the emphasis on how to create a picture rather than details of technique. Her approach to her paintings she describes as ‘representational but not literal’—in other words the images and drawings are real, from life, but are assembled on the paper to make a picture out of colours and lines, rather than to record reality. She is best known for her delicate watercolour flowers that perfectly capture the sprightly characters of the specimens in a distinctive and delightful style. More recently she has been creating bolder more representative scenes inspired by Patrick Heron and Matisse. Jill has worked as a locally based stained glass artist for 25 years. Her work includes taking commissions from private clients, exhibiting regularly and teaching, and she enjoys following her own inspiration as much as encouraging and inspiring other’s creativity. The glass techniques she works with are leading, copper foiling, fusing and slumping, and glass painting. A source of inspiration for many of her designs is capturing fluid forms, and using glass to recreate the way these forms are affected by light and she also like geometric patterns! Find out more on her website: Hurdy Gurdy Glass. 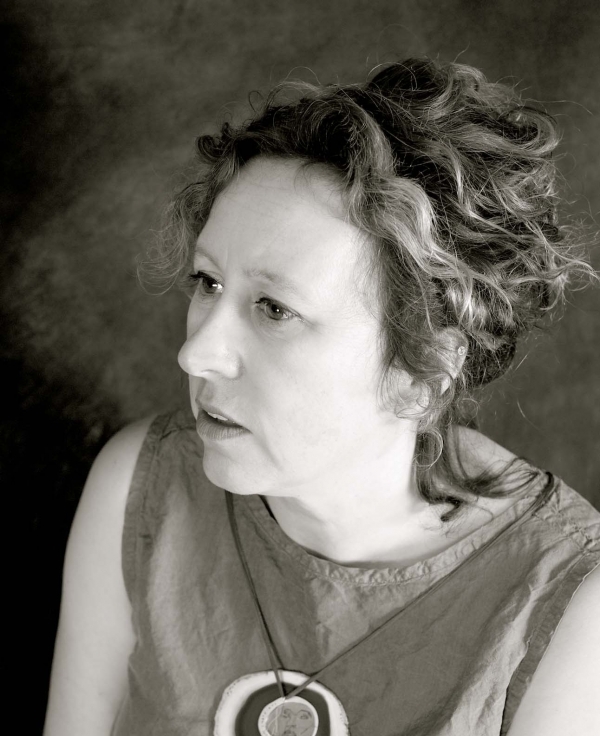 Rebecca Ilett is a sculptor and Jeweller whose work references stories, characters and ideas from literature. Her work often uses traditional methods and materials, chosen for their ability to illustrate a theme or story. She often uses humour and ambiguity in her work as a device to challenge. 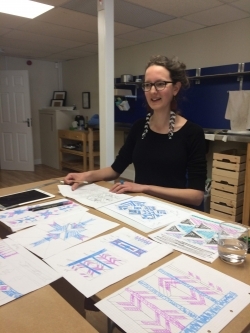 Rebecca has been teaching jewellery making and silversmithing in London and Cambridge for the past 13 years, having originally trained as a sculptor. She has exhibited her work internationally, and was shortlisted for the John Ruskin Prize 2017. Sue is an Artist passionate about print. 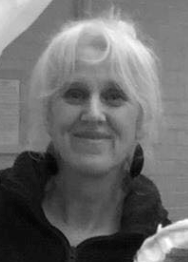 With 17 years experience as Lead Tutor and Studio Manager at the Curwen Print Study Centre Sue devised, developed and delivered many of the workshops including the Certificate in Printmaking Skills. Sue is a Co-Founder of the Cambridge Original Printmakers Biennale, an exhibition celebrating hand pulled original print by the artist. As an artist and tutor Sue developed and delivered printmaking workshops at the British Museum, Blenheim Palace, the Fitzwilliam Museum, Kettles Yard, Museum of Anthropology and Archaeology, the Zoology Museum Cambridge University to name a few. Consultancy and Artist in Residence posts include The Leys, Perse Girls School, Long Road Sixth Form, St Albans Girl School and many more. Church Street Gallery, Saffron Walden, Cambridge Contemporary Art, Espacio London and the Babylon Gallery, Ely are some of the many places she exhibits. Working with varying and multiple print techniques Sue creates multi-layered monotypes constructed of many layers. She draws inspiration from landscape, weather, looking at chaos and control to create new emotional landscapes and visual diaries. 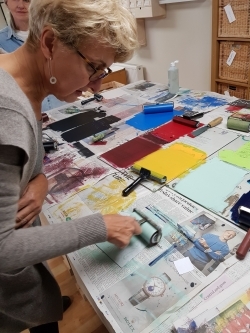 Sue currently teaches printmaking at her own Studio in Wimbish: Stoneman Press as well as teaching at various other locations delivering a broad range of printmaking workshops and courses. Danielle is a self taught Modern Calligrapher and teacher. Inspired by scripts from the past such as Copperplate and Spencerian script and current influences such as Brush Lettering. After studying a degree in Fashion Design in London Danielle has worked for high end and couture wedding dress designers. She now works from her home studio on Calligraphy projects and wedding dress alterations. Danielle teaches Modern Calligraphy, Brush Lettering and Flourishing workshops on a regular basis in Cambridge, Newmarket and Ely. Sheila originally studied Textile Design at the Glasgow School of Art before being drawn towards Silversmithing and Jewellery Design. After completing an M.A. in Jewellery Design at the Royal College of Art in London, Sheila now lives and works in Norfolk. Sheila has been a practicing jeweller and enameler for many years and is a Freeman of the Goldsmiths’ Company and is also a short course tutor at West Dean College, Chichester. Olly is a spoon carver and turner of bowls, plates, pots, boxes and drinking vessels from locally sourced green wood. In 2018 he had the privilege of using wood from the Cambridge Botanic Gardens and the Wimpole Hall Estate. The connection to a place and a history that comes with knowing exactly where your raw material comes from is just one of the many advantages of working with green wood. Simon Rees trained in the 80’s at the world-class jewellery school, Sir John class in London, completing with a very high degree and a number of prizes. His early career saw him working under his own label producing small collections for global designer outlets, most notably Harrods, Charivari’s in New York and a number of outlets in Japan. During this period, he collaborated with a number of designers, most famously Alexander McQueen, the results of which were a number of catwalk pieces recently featured in the V&A exhibition; Alexander McQueen: Savage Beauty. All of this work was designed and produced within his highly successful studio & shop in the famous Columbia Road flower market which he ran for 25 years before opening Rees & Rees in deal, Kent. He has many years experience of teaching at White House Arts and now at Cambridge Art Makers and in his own studio in Deal. Many of his students have gone on to sell their work in galleries around the UK. Elia Rizzo is a Bespoke Jewellery Designer, engraver and stone setter. He is from Florence, Italy, where he has been designing and creating one-of-a-kind pieces for ten years. He has always had both a strong interest in traditional Jewellery techniques and also in finding challenging ways of applying them to create pieces that also have a contemporary taste. Elia studied in Florence, a city renowned around the world for its traditions of excellence in high-end jewellery making and design. 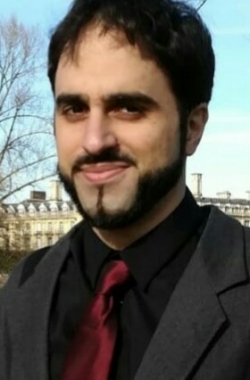 After the completion of his studies, thanks to his skills he was selected for several internships during which he continued his training in hand engraving, jewellery design, jewellery making, stone faceting, stone setting and metal smithing techniques, being tutored by some of the most excellent professionals. He now works as a free lance Jewellery Designer and, thanks to a deep passion for anything related to jewellery making, he never stops refining his skills, making new experiments everyday and always looking forward to new challenges in creating his pieces. Sarah loves foreign and exotic places, vibrant colours and seeing different animals and plants which she translates into wonderful screenprints. She teaches various workshops around Cambridgeshire. The Bangham sisters, Susannah and Rosemary both work for Cambridge Makers, (yes, a family affair)! They have been makers all their lives; with a practicing instrument maker and repairer for a father and a knitwear designer mother and a creative family they didn’t have much choice! 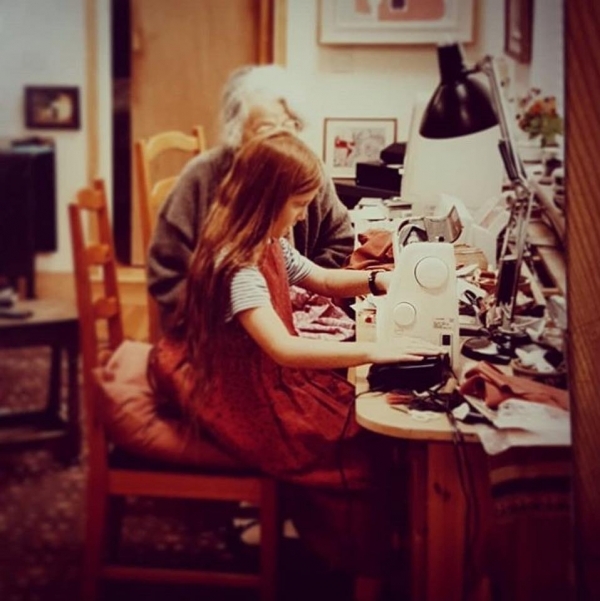 With more than 60 years of making between them they have enthusiasm and experience in making with all kinds of materials and whilst they may not have the accolades and professional training they will share what they know and gratefully learn new skills as they go along. Rosemary studied Visual Culture and African Studies and has worked in the creative industries for over fifteen years. She has run various creative workshops with children in South Africa .